Born on the peaceful utopia of the world called Czarnia, Lobo was different: he was a killer. He killed his doctors, he killed his babysitters, he killed his classmates and teachers, and when he got older, he killed his entire planet. This Minimate is the '90s style Lobo, the "space biker" verison. He's got a new jacket (with his "Bite Me, Fanboy" slogan on the back), a new belt and new mismatched boots. His face is good, but the weird strand of hair that's falling across his face pulls attention away from the details. He'd be better off without it. He comes with his trademark weapon: a hook on a chain. The hook is sized to be held in the typical Minimate hand, and the chain is real metal. In 1982, Superman and the Doom Patrol fought a villain who introduced himself as the Ambush Bug. He wore a technological suit that allowed him to teleport, using tiny robotic insects as targeting devices. He was a pretty lame villain, however, and decided to be a hero instead (though he wasn't much better at that). He became an increasingly silly character, and began serving as a commentary on the industry, rather than someone who took part in the plots. 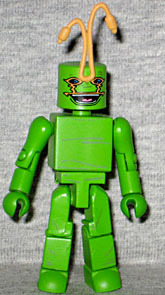 Ambush Bug has never had any kind of toy before, so the basic fact that he got a Minimate at all just cements Minimates' place among the greatest toylines ever. They could have gotten away with making him solid green, but there are a few wrinkles on his chest and legs to break up the design. He has a big huge smile on his face and all the appropriate yellow designs around his eyes, and they glued his antennae onto his forehead - no way to cheat those on a block figure's head! It may not seem very logical to pair a hyper-violent killer and a wacky walking joke, but it does make a sliver of sense: both characters were co-created by Keith Giffen, and when he was given control of them, they both changed drastically from what they had been before, becoming more popular in the process. This isn't a must-have set, but it is a great one if you want it. To me, it kinda makes sense to pair Lobo with Ambush bug, they're both so out there, who else would you really pair them with? Ambush Bug I would have paired with The Heckler. 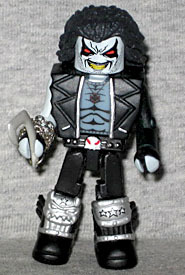 Lobo... Vril Dox? Santa? I really really want a Santa Claus minimate now.